Today, I will write about the work of reviewers for scientific conferences. As you probably know, when a researcher submit a paper to a conference, the paper is assigned to usually three or more reviewers. The program chair of the conference usually give one or two months to the reviewers to perform the reviews. It is interesting to see that reviewers seem to procrastinate. 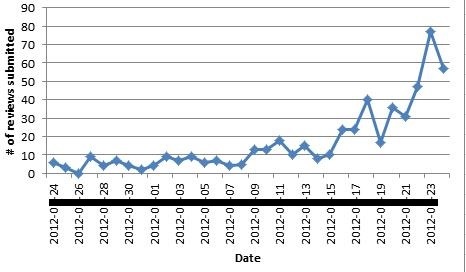 As it can be seen on the chart, during a reviewing period of one month, most reviews were submitted during the last few days, just before the deadline. Therefore, this raise the question of how much time does a reviewer really needs to perform review? If a typical reviewer would be given two months or three months instead of one month, would s/he also wait to submit the reviews during the last few days? I have to say that reviewers are usually very busy and have to review several papers. A reason for late review may be that reviewers prefer to submit all of their reviews at the same time or are just too busy! I just wanted to share this interesting observation. If you like this blog, you can tweet about it and/or subscribe to my twitter account @philfv to get notified about new posts. Philippe Fournier-Viger is the founder of the open-source data mining software SPMF, offering more than 50 data mining algorithms. it might also be the case that reviewers use the flexibility in terms of doing their reviews to attend to more urgent matters/matters that are more pressing. As the time for submission gets closer, the urgency of submitting the review rises and the number of reviews going in too. If I remember correctly, there should be some classical psychological paper on the effect of time on the evaluation of consequences which would apply here..